Why would anyone read a book entitled How To Eat Out? I know how to eat out. You pick somewhere and book a table. You turn up at the agreed time and sit at the aforementioned table, pick what you want off the menu, then eat it and go home having spent quite a bit of money and often feeling a bit disappointed/anticlimactic/heartburny, wondering why on earth you bothered leaving the comforts of your own home in the first place. Oh yes, you fancied not having to wash up that evening. Well, that was worth the difficulty parking, the taut discussion on whose turn it was to be the designated driver, and the soggy-bottomed starter that will be reappearing sooner than you would have liked. My book on How To Eat Out would probably run to two words – don’t bother. 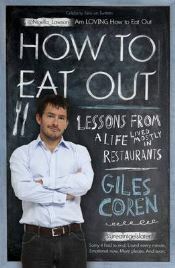 But this is not my book, this is a book by The Times’ restaurant critic and sometime TV presenter, Giles Coren. Coming in at a little over 280 pages in paperback, How To Eat Out is largely a selection of Coren’s favourite Times columns strung together with little bits of new narrative to hold the thing in a semi-coherent whole. We get to hear of Giles’ early exploits in restaurants, eating out as a restaurant critic, visits to Japan and France, and even what it is like to make a food history TV programme. These chapters are undoubtedly entertaining, as even when the man is being either a posh boor or an over-opinionated pain in the backside (which is quite a bit), there is no doubting his love of good food or his ability to write about it at great length, with wit and style. There is a good reason why he has written about food for The Times for over ten years and other publications before that. His descriptions of some meals actually made me hungry they were so good; this is certainly not a book to read if you are on a diet. I’m still craving Chinese food since I read the Chinese chapter in the book (“the prawn toast is golden and fat: lovely fried bread with magical pink flesh and a dusting of meaty seeds”). On the downside, it is highly likely you will finish the book feeling guilty about eating bread (“you are not a Victorian orphan. You are not a medieval leper at the gates of a big castle. You are not a f***ing circus elephant. What in the world do you want with a bloody bread roll?”); ordering steak in a restaurant (apparently only done by those who are afraid of food and won’t have something more interesting) and buying bottled water rather than insisting restaurants give you iced tap water (which is actually surprisingly reasonable). Civilised people apparently also don’t dine early in the evening or eat pudding because “you are not eight years old” and dessert is empty calories. Unlike the copious amounts of booze that you like to put away on a regular basis, eh Giles? No health consequences to that. Except I shouldn’t say “like”, because “liking” or “disliking” something is a bit childish – you should eat all foods and have what is good in any given situation. Which does make me wonder what you should do if the steak is actually what is good at the restaurant you have gone to. In all fairness, this book does also manage to offer up the odd section that manages to be of actual practical usefulness. How to get the most from local restaurants, how to get the most from a sushi restaurant, and how to complain were full of the practical advice I expected to make up the majority of the book, dropping Coren’s extensive experience and knowledge into situations where the rest of us can actually benefit from them. I just wish there was more of this, and less telling us what it was like eating out with his father (the famous Alan Coren), what it is like in some of London’s poshest restaurants (when will 99% of his readers ever do this?) and less of the calling women he dated “chicks”. It might have seemed amusing and roguish when he was writing it, but for a privileged, married forty-something man with kids to do this just seems quite pathetic. Less casual misogyny, more advice on, well, How To Eat Out, please. Oh, and less making me feel bad for choosing the sticky toffee pudding instead of a bottle of expensive wine; it is no worse for you, costs a good deal less, and doesn’t impair my ability to drive home safely and legally once the meal is concluded. Recommended to those who are already fans of Coren’s writing or who want the useful inserts between the entertaining-but-unhelpful bits of the book. Not recommended to anyone who wants to go out for dinner at 6pm and have a bread roll and dessert with their steak. No Comments on "How To Eat Out"